Eulalia A. 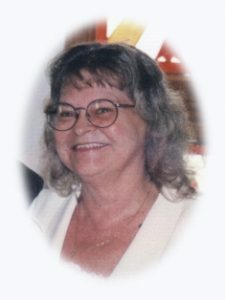 “Eula” Bledsoe, age 71, formerly of West Bend, WI died Sunday, July 17, 2016 at her home in Madison, WI. She was born on June 29, 1945 in Milwaukee, WI; daughter of Stanley and Irene Graunke Navarre. On February 25, 1967, Eula married Willie K. Bledsoe of Port Washington at St. Ann’s Catholic Church in Milwaukee. A few years later they moved to West Bend and raised their family. Willie worked at Briggs and Stratton in Milwaukee for many years. Eula was a homemaker. Willie preceded her in death on March 1, 1998. She moved to Madison in 2006 to be near family. Eula is survived by her children John (Ann) Bledsoe of Nekoosa, Terrylin (Daniel) Neuy of West Bend and Michael (Dennis Balczewski) Bledsoe of Madison; eight grandchildren Brandon (Amanda) Bledsoe, Joshua (Alexis) Johns, Tasha Johns, Cheyene Knudtson, John “Jay”, Daniel, David and Rebekah Bledsoe; three great-grandchildren Sophia, William and Callie; her sisters Elizabeth (Tom) Wilber and Annette Navarre, both of Wautoma; her brother Daniel (Gloria) Navarre of Whitewater; sisters and brothers-in-law Billie Jean “Betty” McGinnis of Hales Corners, Linda (Orlan) Miller of Denver, Brenda (Dave) Barnekow of Winter Haven, FL, Wylie (Jean) Bledsoe of Dubuque, IA and Chuck (Linda) Bledsoe of West Bend; further survived by nieces, nephews, other relatives and friends. She is preceded in death by her husband Willie, brother Stanley Navarre, sisters-in-law Jewel Flores and Ruby Arendt and brother-in-law James Bledsoe. Funeral services 1PM Saturday, July 23, 2016 at the POOLE FUNERAL HOME/Crematory, 203 N. Wisconsin Street, Port Washington, WI 53074. Family will receive friends from 11AM-1PM Saturday prior to the service at the funeral home. Final interment Union Cemetery, Port Washington.